Did you know that Doberman‘s were a man-made breed of dog. The Rottweiler and The Manchester Terrier are the breeds that makes up this breed. 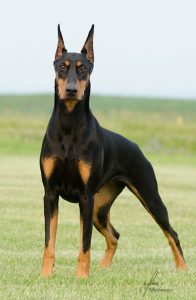 This breed was developed around 1890 by a man named Karl Freidrich Louis Dobermann who was tax collector in Germany. The Rottweiler was used, due to its massiveness and intelligence. The Manchester terrier made up the black and tan color. This made the dogs inherit their elegant looks. When Louis Dobermann passed away in the 1800’s he left his bloodline in the keeping to a man named Otto Goellar. It was then speculated that Otto added the greyhound black in coloration. This would certainly account for the stamina, height, and the speed of this dog. The Doberman does not stand on his pads but his toes and they have an even and very graceful gait. Most people will cut the ears and dock the tails but in some countries this is illegal. Doberman’s are very intelligent and alert, they are very loyal companions and great guard dogs. Personalities in these dogs may vary, but with a lot of love and proper training these dogs are devoted companions. They can be great family dogs also. These dogs are driven, strong and stubborn. But once they establish their place, they are eager to please but never let them be the alpha in the pack. Make sure your dog knows who the boss is. The doberman can be very excellent with children as long as they are properly trained. They adapt quickly and look to their leader for cues, and value the attention they get from them. Although they are working dogs, most people stereotype these dogs and they are viewed as intimidating. Nothing could be further from the truth. They are loyal to their owners have a high intelligence and very easy to train. These dogs lifespan only last about 10 or 12 years. They can suffer from a number of health problems such as dilated cardiomyopathy, and its the major cause of death in this type of dog. The cause of this disease is unknown and is believed to be created by the interbreeding of this dog. The single exception is believed by vets that the mixing of the Manchester Terrier and the greyhound is the reason that a gene may have caused this condition .